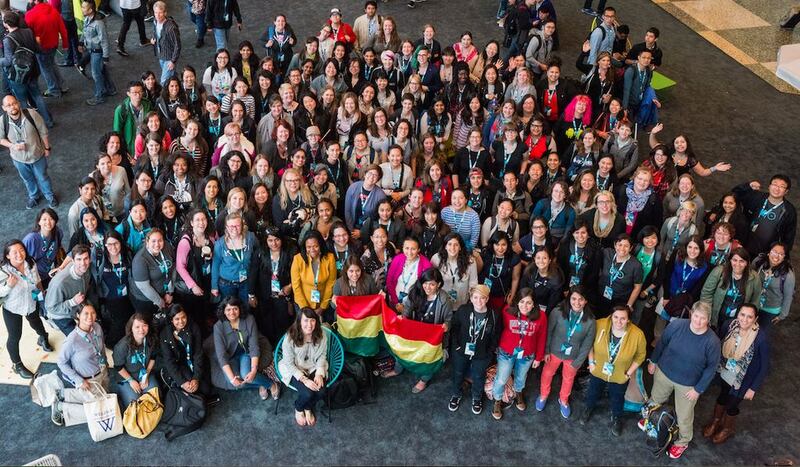 A Past, Present and Future Journey for GHC 15! This year GHC will be awesome!!! Oh, ok. Let me back up a bit. Did I say 12K women? Have I mentioned the sessions? Have you heard that it’s “Our time to lead!”? First, some background information about why I am really excited. My first GHC was back in 2012, and I think it was the first time I really feel like I’m not alone -or, to be more honest- I’m completely normal! I get to meet with an enormous number of women in STEM fields and although it was my first time, it felt like I was within GHC community for ages, where everybody has a similar story and is more than welcome to talk/share/consult/mentor/mentee/help anytime. I know it sounds a little cliche if you haven’t experienced being a part of something so huge but so intimate; but believe me, that was the closest realization for “It’s a small world” attraction of Disneyland. As happy, as connected, as pretty, as diverse, …as utopian! As a recap, on the first day, the first ever session I have attended in a GHC: A wonderful interactive networking talk, given by two speakers from Lawrance Berkeley Lab and Google. After 3 years, I’m still so glad to catch this session, it was like a jump-start for the conference. This session taught what I was doing right unconsciously when approaching people (as an introvert), what I was totally wrong at, and what I actually should do in different situations. I probably created an elevator speech for the first time in my academic life, because of that session. Enough with the day, let’s discuss the nights! The social events in the conference were spectacular. The awards ceremony was so inspiring that getting to know such work and such amazing people was a motivation all by itself. There was also a celebration for the 25th years of Systers community, which was like a closing party, and it was in the Maryland Science Center… This might still be “the event” of my life. Let me elaborate. Imagine a science center, full of dinosaurs, body parts, machines and experiments, with a planetarium! Now imagine islands of desserts, hills of cupcakes and cheesecake, and sweets that you ever saw. Finally, imagine hundreds of women in science. Now put them all together… Amazing, right? Oh, just to mention, there was a live disco right outside too. And when you get bored of dancing, you can just watch a wonderful night show in the planetarium. It was an amazing experience overall. Attending Grace Hopper is a wonderful experience as well as a precious responsibility. It is not just a regular conference that you attend to, and then forget about; but it shapes one’s lifestyle, priorities, and perspective. It makes everyone feel that we are never alone. It gives tremendous amount of motivation by sharing, just sharing. Stories from your everyday life, experiences from reactions you are subject to, what-if scenarios if you do not assess those situations, emotions if the imperfect situation captures you, challenges to beat the imperfect situation, in summary, everything you have experienced and might experience in your everyday life is shared. This connects everybody to support others’ cases, to union and to act together for the parallel challenges. So both for academic and volunteering activities, GHC community always keeps this collective organism fueled up. Inherently you share too. You see the newcomers, and wanna be there before they fall into that hole you have fallen before. You want to pass your experience, pass to torch as the others have passed to you. You want to carry the organism with you and make it more invulnerable. It sounds silly, but realizing that all the wonderful ‘godlike’ people are also a part of the organism, (that they’re always in reach or they make mistakes or they eat cupcakes or they moonwalk), makes you feel more rewarding and confident. You realize that it is only you, what makes it special. If you forget how to enjoy, or if you sacrifice your unique character to become a slave, that’s when you being to lose, that’s when trying to be perfect harms you. You realize that balancing and being in charge of unbalancing should be the key to their success, so as yours. At the end, you want to keep those connections and improvements alive. Thus, you come to a point that you understand that GHC is not limited to 3-4 days. We are all connected with Systers, WISP/WIE programs, CRA-W, and local CS people. And after a while it becomes a life-style, to protect and develop the self and the organism, by taking part in all events, volunteering for all opportunities, and advocating wherever you see something wrong. You also get amazed (see my first lines:) ) that how such a huge product can consistently be kept alive. You admire the creators and defenders of our fragile but connected world, most of which are only volunteers, and appreciate all efforts, all time commitment, and all the love given to our community. Of course, GHC will keep impacting the world, again this year. I have been saying that after a while you just need to be “more” a part of it, right? Well, after being a Communities Volunteer for 2 years, this year I’m proud to be on the Communities Committee and help organizing this awesome “get-together with friends and systers”. Thus, it’s an honor for me to actually spend labor in this event which I completely believe in. Rest assured that our committee is working like bees to enable everyone to make the best out of the conference, with new events, gatherings, channels, and news! This year is especially important for me, because I’ll be presenting my pretty buildings in #GFX session. Looking back and realizing that how far I have come since the misty first days of PhD, I can’t wait to share my awesome work while looking each one of you in the eye! If you want a trailer about the presentation, I suggest you to have a look at our papers . Else, you’re invited to my talk on Wednesday Oct 14 at #GHC15. You’ll definitely level up! Both motivated and armored! Socially, academically, and personally. Maybe after reading this, you will want to be a volunteer and start being a part of us, now! But more importantly, I believe you’ll become one of us, you’ll find yourself both similar and different enough to be comfortable with the crowd, and you’ll realize that the imperfections of any systems (human-centric, data-centric, process-centric), can be overcome by a little environment support. Can you imagine? Can you think about the accumulated knowledge we can obtain from this year’s GHC? Now, is it possible to not be excited about such an adventure??! I’m already amused and can’t wait to be in Houston. I hope to see and meet each one of you, to embrace our community, to be useful for our living organism, and to carry this perspective onto the new generations. Thank you girls, see you in Houston!